The story in this book is even more action packed than the first two book. The growing number of characters all make appearance in this book. This always was my favourite book in the series. This was planned to be the last book in the trilogy, but for some reasons (money most likely) Mary Hoffman decided to create three more books (perhaps there will be even more book, who knows?). But sometimes it's better to leave it at a trilogy, because the story was really finished now after the three books. (And besides, the people who this book is aimed at (I guess about 12 years) are now so much older, that they like the books less (or, that happened to me). Thinking about these books, I noticed the resemblances to Game of Thrones (the political power struggle intrigue part), there even is a wedding ending in a bloody disaster?! 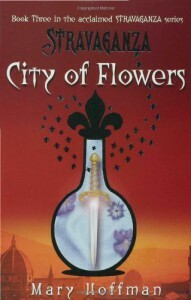 City of Flowers Mary Hoffman Review Stranger-Than-Reality Stravaganza UK What-Year-is-it?